I had the opportunity to work with Annie Damman for her senior session. It was such a treat to photograph her. Annie had such fun outfits and great ideas. She was so comfortable in front of the camera and her smile was infectious. Annie also has the most gorgeous hair. 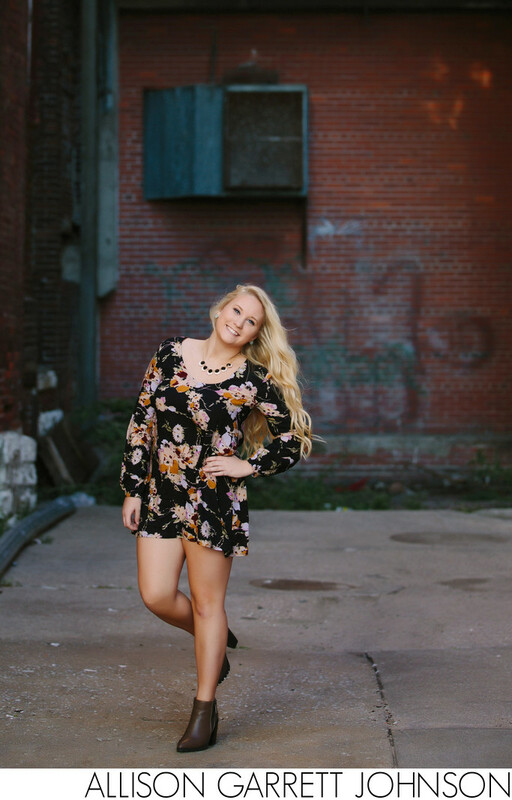 For her session we started in downtown Lincoln. Annie is from Seward, but requested a session in Lincoln for a little different look from most of her Seward high classmates. I am always happy to travel and always have some fantastic ideas for Lincoln locations whether I am shooting seniors, families, children or couples. I have clients that often request sessions in the Haymarket, but if they are not looking for something specific in the Haymarket I often suggest traveling a little further east to the other side of 10th street where we can explore more of downtown Lincoln. It tends to be less busy and has some amazing settings for a more urban look. This particular photo was taken by the loading dock near the Gold's building at 10th and O Street. The lighting was perfect and it had some great graffiti on the brick in the background. I loved the opportunity to work with Annie, as well as all seniors. It's such a fun point in their lives to document. Location: 150 S. 10th Street Lincoln, Nebraska.